The house was built in the 1730s as New Merridale Farm. It was extended and improved during occupancy by Thomas Herrick about the beginning of the 19th century and renamed Merridale House. The house had several tenants but in about 1864 was bought by Thomas Bantock, a canal and railway agent. His son Albert Baldwin Bantock, who was twice Mayor of Wolverhampton and also High Sheriff of Staffordshire in 1920, further improved the property following his father's death in 1896. 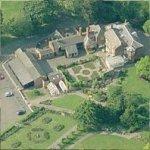 On his own death, without children, in 1938 he bequeathed the house and park to Wolverhampton Corporation. The house was renamed in his honour in 1940.